At this final phase of our bifurcation from Old Earth, we find ourselves traversing the space between Old Earth and the New Vibrational Earth, in which, some of us, have consciously chosen to dwell. 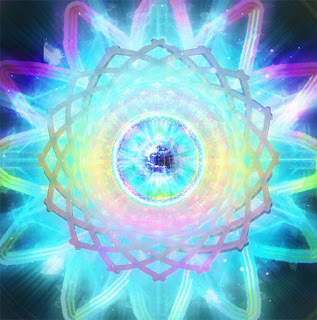 At this time, some ascending souls, already are anchored within a fifth dimensional real, while many may find themselves still navigating between the 4D portal that leads us into this New Timeline, for in truth, it is all a matter of how we choose to vibrate and radiate our essence more than a number or physical dimension. At the moment, we are working on the synthesis of all the aspects of us, which is not a one-day process or something that is done by simply reading or by just going to one healer after another, but by consciously awakening our cosmic spark and walking the talk. A message of inner fusion that this new month, with its Scorpion energies reminds us. For it is precisely in the unification of our inner polarities, where the ascension path begins. It is by healing all the unlove, blockages, and fear once unconsciously embodied or imposed by outer manipulation, that we begin to unveil the many fake layers of illusion - that once we believed - and embodying a higher level of awareness. As we continue our process of inner fusion - and healing - from old programming, our ability to co-create improves. As we continue to merge the opposite polarities that lie within us, so does our ability to expand and give birth to something new that can only be birthed by the merging of opposite, but again, complementary forces. This is where we are, birthing a new self and timeline as we keep also mastering how to be fully anchored within our choice, trying different possibilities for us to experience. From a collective perspective, Planet Earth seems to be experiencing its most chaotic period for a long time. Please be observant and look beyond the false propaganda, the misinformation that is given to manipulate us by the dark forces, to discern what is truly occurring behind the physical scenes. It is true that our Planet is in deep transformation - from nature - in the form of natural disasters, to climatic change as well as many other issues such as political ones. However, it is also true that the light polarity is being strongly reinforced by the many new souls who are awakening as well as the work of the many Light Bearers, Starseed Souls, raisers of consciousness, and New Earth Seeds that are being the pioneers of this transition. It is all about where you choose to focus your attention. For to be able to experience the deep bifurcation that we are passing through, first the formation of extreme poles need to emerge. As we continue our transition into New Earth, if we look behind, we will see more "chaos" but this is not all that is happening, this is just an aspect that for us, as ascending souls, is clearer now to us, for where we are going there is not such a deep sense of polarization. Therefore, it is so important to remain always in the Wisdom and loving Essence of our God Self, for every time we look into the sides, or the past, we are bringing this same chaotic frequency into our present vibration and hence timeline. This is not the same as denial, for we are not denying the evidence of our human nature, but embracing both without judgements and choosing the state of being that is more aligned with who we are now. We do not need to ignore, label or try to fight anything, for we know, that we simply need to be to expand and leave behind what we have experienced for eons. We hold now in our hands the moment some of us have been waiting for, a moment, and gift, in which choosing where to dwell, whether in old or New Earth is essential, for the double body of Earth is already occupying a new time/space zone within a higher octave. The question is: “Are you willing to do what it takes to let it all go and begin an unknown but blissful journey of conscious co-creation and integration?” This question is not replied by a yes/no question, your feelings, thoughts and action, will let you know where you are in frequency. If you still read, agree but then do not act accordingly with what you truly desire, then your own actions are showing your lack of integrity, which is perfectly fine if you are aware. If you still think that acting is more important than BEing, then you are again polarizing and allowing your masculine essence to be constantly bringing something into form without the proper nurturing it needs from the feminine within. If you know what you need in healing/dissolving and yet you continue to separate, judge and manipulate, then you are not ready to release an old aspect of your 3D egoic personality. It is very important that we understand that to be able to evolve, first something must "break" within ourselves to trigger the transformation/reorganization required in our inner worlds, beliefs and everything that used to be familiar to us. As many of you know, by personal experience, at first, one begins to be against everything and everyone that feels a lack of awareness and compassion. Even if these first stages may seem chaotic, for the ones who are stepping into this journey, you will realize, at your own time, that trying to fight and change what you cannot is just a waste of your energy and intention. As one evolves, as once happened to many of us, one understands that the only thing we can truly change is ourselves, and it is then that we cease to fight the outer world and begin to move into our inner one, being able to finally bringing this change to All. At the moment the collective is fighting what they think they can change, or the outer conditions, let them be. It is also an important part to help others awake. The important thing is not what they do or not but what we do with our own frequency. If you choose to focus only on the dark forces, then you will begin to vibrate within this lower range, manifesting it into your reality, and hence seeing only chaos. By referring to the collective and how they try to change things, I am not talking about the light workers who works peacefully to bring great shift into certain things, as it is human rights, conscious eating etc, for they bring healing and deep transformation, as well as unity, to All. I am talking about the ones who are beginning to awake, when in their first phases, try to push others by force to think as they think and to change things in the outer that cannot be changed, for the dark side must do its function in a dual Universe. It is by neutral observation, especially at the end of the day, by taking some time to become the eternal witness that we can be able to discern whether our egoic self still dominates us or whether we have become the masters and hence sovereign beings of our own life experience. At every moment, we have the opportunity to choose, we do not really have many choices, for all choices are a matter of deciding whether dwelling in love or in fear, and at every single second, we are given the gift to become aware to where we are given our attention to. The process of soul integration, even though an endless one of constant remembrance, leads to a higher connection with our Monad, as this is the next step when we begin to integrate higher aspects of our soul, from a whole space. The nourishment of our connection with our Monad, is pivotal for the ascending souls who are in service to the human evolution, for we do not walk alone in this earthly realm, and the more we cultivate this connection, the more we will realize that we have never been alone, on the contrary, acting as One, at all times with the higher aspects of us who dwell in the 12D, whether we focus more on separation and in the individualized aspect of Source that we are, or whether we were more conscious of this Higher Connection. It is essential that we begin to embody the remembrance of who we are in Essence, for it is only by doing so that we will begin to act with more integrity and consciousness, remembering more aspects of our soul mission as well as our true purpose for us within this human incarnation. A lot of people daily wonder what is their soul purpose, when one is in this phase, asking outside and trying non-stop to search for a clue, will not serve your inner quest. What has helped me in my journey, until the moment comes of being consciously aware of what we are here to do, is to follow the steps my soul guided me in order to be able to descend more wisdom about my soul purpose. The initials steps are often about cleansing, healing and beginning the work of soul integration, for if we do not begin by purifying ourselves, the veils that cover the Truth will continue to impede us see what we are meant to. To be able to embody this Monadic connection and hence, more wisdom, first we need to work on the dissolution of all the old beliefs as well as clear our emotional and mental bodies that are covering this connection with our Monad. After regaining the proper balance and purification, we will be able to realize that we are just an extension of other aspects of us who remain in other planes but that are breathing, feeling and acting as One with us. It is when this illuminating moment comes, that we leave all egoic desires aside and begin to embrace a higher path of selfless service, for we now remember that we are no just here to fulfill our mere egoic desires and experience a human plane, but to be able to bring this higher essence as well as its wisdom to All in our unique way of being of service. At a Planetary level, the expansion that we all are experiencing, from within, in our unique way, is also repressed by Jupiter, especially by being now in the depths of Scorpio. Another aspect occurring during the beginning of this month, is Jupiter quintile Pluto on November 3. This frequency will make a deep impact within the collective, helping them to keep awakening and deepening within their own evolutionary path. This will be of great assistance as well for the ascending souls, to go further in our soul mission, and descend new aspects of it. This will help us all to awaken dormant soul gifts, go beyond our human boundaries and see behind the physical picture, all the dormant potential that remains untouched within the depths of our being. The previous day we will also have a very important cosmic event, as Saturn will square Chiron, the Cosmic Healer. Have you ever woken up in the middle of the night suffering - with anxiety - without knowing why? Do you still tend to repeat the same old scenarios, even if you try to manifest a different outcome? Have you ever noticed the unhealed pain beating inside your heart, even if you try to cover it with addictions or any veil that will bring you the illusion that there are unhealed wounds? If a part of you is still in pain, whether it is because it remains living in the past or whether in loss, you still have not ended the healing required with your emotional body and unconscious wounds. With this alignment and the wisdom and higher awareness from Neptune being direct again on November 22, for as you know the energies do not last just one day, we will have the cosmic gift of bringing the unconscious into the light and begin to work with all the aspects of ourselves that remain in darkness, suffering due to the separation we brought to them. It is a time to take full responsibility for every thought, for every action taken and realize that there was never something you made wrong, whether to you or onto others. There are simply acts committed by being in a lower state of consciousness or fear. Now you have embodied higher aspects of who you truly are. Now you are freeing yourself from delusions of what you never were. Now is the time to forgive yourself, for all the unconscious acts made from when you were a totally different person. You came to love, to enjoy, and to open your heart to the things your egoic self has been fearing for a long time. There will be a portal opening between the Taurus Full Moon, on November 4 and the Scorpion new one on November 18. The full moon in Taurus will serve to anchor balance between our earthly and ethereal realms, for Taurus is ruled by Venus and Venus is in Libra at the time of this full moon, so this is another confirmation for us to bring inner synthesis within ourselves and hence within our human lives. On the other hand, the Scorpion’s Moon will be of great assistance to connect with our God Self and begin to descend and anchor this wisdom within our tangible plane, for this is what truly serves and helps us ascend, it is not by dwelling in the ethereal that we evolve, but by bringing all this transformation, purification and higher wisdom into our bodies and dense reality. This is a very important phase for the ones who work with bringing stabilization as well as for the ones who work with Earth's Grids and as New Earth Anchors - holding the proper frequency - acting as bridges - to New Earth. For we all are experiencing many imbalances, as well as changes, in our physical system and should try to remain for as much time as possible in harmony, for if we collapse, then we will not be able to assist. Many of you are going to be call to be of service in a different or broader way, I was told many are now guided to travel and anchor in the places that their essence will be of higher service. Others may change location and begin a new phase there, for even if our lower self tends to get attached, it was never about us, or about what we like or not, but about a Higher Will. Raisers of consciousness, as I call them, are the ones with the soul role of remaining, always, in their highest possible frequency, vibrating in the range of love and compassion to be able to raise the frequency of our Planet. They are the ones that work from within and wherever they go they are felt as peaceful warriors, bringing love and joy to everything they touch. They are essential to keep the Planet in balance for without their work, the Planet could not be able to sustain the proper essence required for this planetary transition. For the stabilizers, as you already know, there is a lot, as usual, happening when we stabilize, whether in the astral, when awake, or doing it fully conscious, for as many of you have felt, the attacks from the dark forces are becoming more recurrent as they are doing their mission of trying to keep the planet asleep, as it used to be for eons. • Huge pressure in your crown chakra - especially for the ones having a personal inner shift. For it is shifting and adjusting itself to be able to embody the New Light descending from our I AM Presence. • A deep sense of heaviness in your legs. • Vertigo - especially common after navigating between different timelines, for we are now pretty much in contact with other aspects of who we are as well as its many realities, where they exist. • Headaches - as an invitation, between many other causes, for you to work on your mental body and clear it. Feed yourself with what serves your body to integrate this new light better, you know yourself, and we are all unique, so what serves for my body may not be what helps yours. Drinking lots of pure water is essential, for water helps us conduit the light - Divine Wisdom - we consciously integrate at the same time that purifies all channels. Above all, remain always in the loving embrace of your God self and its infinite compassion for All, instead of focusing on the drama and chaos that other dark forces create. It is indeed a very intense passage, which is why it is essential to trust and surrender to change. One of the experiences that begin to arise when we step into a new path of conscious co-creation, is that as we continue to expand, our inner light will let us know when it finds an obstacle, something we call being in a painful situation. This is where you need to clear the path, beginning from within. This is where your soul is asking you that you must take a break and dissolve all the obstacles that are impeding the expansion of your inner light through new horizons. Everything is created within and experienced without. If you are passing through certain challenges, then, you must become fully aware and take the responsibility to understand that you have created all to begin with, just because you need to master something new or that you are not seeing yet, or because you need to keep learning how you use your frequency. There is no one or outer force doing this to you, unless you too invite it by not claiming your sovereignty and ownership of your sacred space. It is a time where only our inner compass will help us navigate through this new timeline that we are so eager to experience. For now, for us only constant change will be our new reality, as there is nothing ever fixed or lineal, or a final destination to reach but infinite expansion to be experienced and enjoyed. There is no I need to go to this place and do this or meet this person because then I will experience happiness, there are no musts, there is only the bliss of being fully anchored within this unique Now moment. We do not need to see where we are going, or the next thing that is going to occur, for we are the ones who decide, to begin with. We only need to count with the blessings of the moment and with the inner strength and power we all have within that will help us conquer new horizons no matter the many challenges we find in them, for now we know, it is in them that we find more growth and wisdom. It is not anymore about where we are heading, but about where we are now and what we do with where we are that will create this next new moment that we wish to be magical. The gift of making this next moment as you wish, is not anymore outside, was never there, it is within, always was, the different is that now you are breathing, acting and thinking as a conscious being, aware of your own power and with the wisdom enough to know how to use it to assist yourself and All, for now you remember that You have always been a part of All.